Dozens of mattress-in-a-box companies have come out in the past year, and most of them are extremely similar to the point where I don’t even bother reviewing them. But occasionally, one of the companies that contacts me for a review is actually different from the others, and I agree to review them. One such company was Wright Bedding. Whereas most companies are selling a 10 inch foam mattress in a box for about $900, Wright is selling a 11 inch foam mattress for about twice that price. I had to see for myself whether it was worth it. The short answer: it is for some people. For the long answer, keep reading. 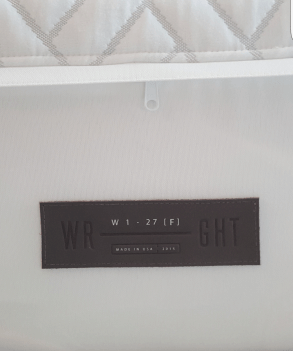 The Wright mattress label. The 1.27 stands for the 27 prototypes they went through before deciding on this one. This part gets a little technical, so feel free to skip it. But if you’re a nerd like me, you like this stuff. The Wright mattress is an 11 inch memory foam mattress made in the USA. The top 1.5 inches are 4 pound density memory foam (which is denser than average; 3 lb is roughly average, 4 lb is considered pretty strong). Below that is a 2 inch layer of 3 pound density foam, and then 1.5 inches of 5 pound density foam. The bottom 6 inch support layer is 1.8 pound density high resiliency poly foam (which is very common.) The middle layers are also designed to promote air flow. I spent quite a bit of time on the mattress and it didn’t really warm up, so it’s good in that respect too. The foams overall skew a little stronger than average, so you might get an extra year or two of use out of a Wright over some of its competitors. All of the foams used are CertiPUR-US certified, which is nice, but it isn’t anything too special. Most USA-made mattresses have that certification, as do a good number of Chinese imports. It’s the very minimum you should expect from a mattress. The important thing to look for in a mattress is how it feels. This one is just on the firm side of medium. On a scale from 1 to 10, where 1 is concrete and 10 is a marshmallow, this is somewhere around a 4.5. You’ll squish into it a bit, but it should keep you mostly in alignment unless you’re either extremely skinny or extremely heavy. (Or put another way, you’ll like this if you like luxury firm or somewhat plush mattresses. If you like it extra firm or super soft, this is not for you). Luckily, most people need something in the medium-firm area, which is why most companies with only one model target that firmness. Despite being a memory foam mattress, you don’t really get stuck in it as much as you do with some other brands, like Tempurpedic. It’s not as bouncy as mattresses that use latex or a latex substitute either; it’s somewhere in between. The unique thing about Wright Bedding is they will deliver and set up their mattress and haul away your old mattress for free. The other companies in this space will just ship you the box and let you set it up for yourself. Wright’s delivery service can save quite a bit of hassle. They say they can deliver in “as little as one day,” but more realistically it will take a few days. Wright offers a 120 day trial. If you’re unhappy with the mattress, they’ll come and pick it up for you and give you a full refund. Most companies in this space offer a 100 day trial. Most foam companies have the restriction that the sag has to be at least 1 inch deep to qualify, and I can only assume that’s about the same threshold that Wright uses, but that’s just a guess on my part. That said, if your foam mattress has a 1 inch indent in it when you’re not on it, I’d argue that it “impacts its performance” and it should qualify as a warranty issue. As I mentioned above, the foams that Wright uses are mostly denser than average, so I’d expect it to keep its shape for much of that 15 year period. It seems unlikely that you’d have any warranty issues. My only hangup about this mattress is the price. If this were yet another $900 mattress like the rest on the market, I’d recommend it for most people. However, it is $1785 in a queen (coupon code MN100 takes this down to $1685). In some respects, the price is justified. Wright uses some really high quality materials, they deliver and set it up for you, etc. However, there are others on the market that are almost as good quality and feel very similar, but for a lot less money. Also, like most direct-to-consumer mattresses, the price is just for the mattress. You will need your own base (boxspring, platform bed, or adjustable base). In my opinion, if you are doing well enough to be able to afford the Wright, you can probably also afford a luxury feature like the adjustable base. The Wright mattress is a good quality memory foam mattress. However, you do pay for that. The Wright mattress has a few small benefits over the others. It uses denser foams, has a 120 day trial (rather than the 100 most use), a 15 year warranty (rather than the standard 10 year warranty), and they’ll deliver it for you. The only downside is the price. You’re paying a lot of extra money (anywhere from $500-$800 more) for those upgrades. If you’re in a financial position in which those few hundred dollars isn’t a big deal for you, the Wright is a good choice. Otherwise, there are others that will be almost as good for a lot less money. For some examples of such mattresses, see my “related articles” below. Click here to buy a Wright mattress, and enter coupon code MN100 at checkout to get $100 off. Hi, i read your blog from time to time and i own a similar one and i was just curious if you get a lot of spam responses? If so how do you prevent it, any plugin or anything you can advise? I get so much lately it's driving me insane so any support is very much appreciated. Thanks for your whole efforts on this web site. My mum take interest in managing investigation and it's easy to see why. My partner and i learn all relating to the dynamic method you convey invaluable information by means of this web blog and in addition boost participation from visitors about this point and our princess is actually starting to learn a great deal. Take advantage of the rest of the new year. You are always doing a superb job. The Wright article is fairly recently updated, because I just found out a couple months ago they changed the foams used to be slightly less dense. They're still denser than average, but they were using more 5 pound foam when I first wrote the article and the base layer was denser as well. This weakened my overall recommendation, because the price is still quite high. The Loom and Leaf (which I don't have a review for up yet) will have some strong foams and be somewhat comparable in quality to the Wright, but it will be a fair bit firmer (which may be what you need). Here's my affiliate link for them (FTC disclaimer: this means I'd get paid a commission if you bought anything): https://www.mattressnerd.com/loom You might also consider an all latex mattress, but they feel quite different from memory foam mattresses. They tend to be a lot more durable, but a bit more bouncy. Spindle is one such company, but they don't have a free return policy, so it's a riskier purchase. (Here's my review: https://www.mattressnerd.com/spindle-review/ ) But if you want high quality, that's one way to go. For my personal mattress, I sleep on a Leesa. Of all the ones I got for free to test out, that one just felt the best to me. It doesn't necessarily mean it's best for everybody, but it just happens to be the right firmness for me. Here's my review of them: https://www.mattressnerd.com/leesa-review/ Hope this helps. What are your feelings a year later about the Wright and current offerings on the market? Nest Love & Sleep Medium didn't work out for me - found out that being 55, having back issues and a BMI ~30 worked against me. I wish Nest would have redirected me to a more appropriate choice. 20/20 hindsight - I let my limited income choose the mattress and didn't factor in the cost of back pain and lost sleep/discomfort. Does Wright have any comparable competitors? Is 11" enough for a BMI over 30? I plan on getting down to around a BMI of 25 in the next 6 months - I need proper sleep to make that happen. I am a little leary of the one mattress fits all concept. Really like your reviews - honest and you take the time to test/sleep in the beds and know what you are talking about. Other sites tend to push the beds that give them a bigger affiliate credit. I don't trust sites that are pushing out several reviews a week especially when the reviewers are so much skinnier than average. Out of curiousity, what mattress do you sleep on today as your permanent one? Pricing here is not much higher if we consider durability and warranty issues, of course including other standard features. Thanks for this, that is new information that was recently added. When I wrote the article, they didn't specify the depth it had to sag to, and when I emailed the CEO, he gave kind of a wishy-washy answer about wanting to keep the customers happy and didn't give me a number for the amount of the sag. Hi: Thanks for the information on your site! I have been researching mattresses and Wright is high on the list. Your info above talked about the warranty and had some questions on indentations. I found this statement on their website, in the FAQ section: "We guarantee our mattresses against defect or deterioration for 15 years. If the mattress breaks down in that time, we'll be happy to replace it for a new one. 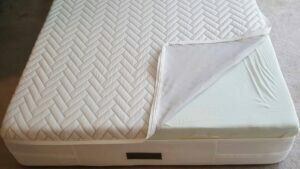 This coverage includes any material change to the mattress that impacts its performance, including any sagging or indentation of more than 0.5". Stains and surface discolorations are not covered." The .5" sag limit over 15 years, no proration and a replacement, rather than a repair, seems better than any other mattress warranty I have seen. FWIW this makes the price more palatable. The Nest Alexander Medium will be fairly similar but less money. The Leesa and Ghostbed will be bouncier, since they use latex (or in the case of Leesa, a latex alternative). I don't know as much about Lull, since I decided to not review them because they did nothing special. Hi, I am trying to find the right mattress and am considering going right to the top with Wright. Others on my short list (and less spendy) are Leesa, Lull, and Ghostbed. When you make the statement: "However, there are others on the market that are almost as good quality and feel very similar, but for a lot less money" I wondered if you might disclose which ones exactly feel very similar. Since when buying online we don't have the chance to lay on our top four choices and then choosend based on feel. Thanks so much for your reviews! Hi, I am thinking of buying the Wright mattress, my wife and I tried it in their Manhattan showroom and it seems to be really nice, but, after reading about all the mattresses on the market it seems a little bit too pricy. We are ready to pay but I'd like to be sure it's worth the difference. We also tried Keetsa, and it was pretty good, too; we tried Helix as well but that was a little bit weird. There is a Nest Bed showroom we may want to try, haven't gotten there yet. My other top choices based on the reviews are Leesa, Lull and 4sleep. What do you think? Any suggestions?